Lake Tahoe surely is one of the most spectacular settings you’ll ever find for a golf course. Measuring 12 miles across and nearly 1,000 feet deep on average, these blue waters are so pure you could spot a golf ball 75 feet below the surface (and if you did, it would probably be one of mine). Tahoe has been called many things, including “the jewel of the Sierras” and “the fairest picture the whole earth affords,” the latter an observation from the well-traveled Mark Twain. The peace-loving Washoe Indians had the place all to themselves until John Fremont, guided by forecaddie Kit Carson, “discovered” the lake in 1844. A decade-and-a-half later, the Comstock silver lode was unearthed nearby and Tahoe was suddenly a bustling community. By the 1890s, most of the miners had moved on to San Francisco, to be replaced by prosperous city folk who came for recreation. Resort development picked up considerably in the 1950s and positively surged when the 1960 Winter Olympics were held at Squaw Valley, Calif., up on the lake’s northwest rim. The land that would become Edgewood Tahoe Golf Course—located on the southern tip of the lake where the Nevada and California borders meet—had been a stop on the Pony Express and Wells Fargo stage lines before the Park family bought it in 1896 to raise cattle. In 1968, a more insightful member of the family hired course architect George Fazio to build a golf course on the site. Fazio’s nephew Tom has kept the work in the family by touching up the layout over the past decade. In 1980, Edgewood Tahoe hosted the first USGA event ever played in Nevada, the U.S. Amateur Public Links Championship, won by future PGA Tour winner Jodie Mudd, at the time a junior at tiny Georgia Southern College. In 1985, Miller Barber won the U.S. Senior Open on the course by being the only player in the field to break par. The cut for the tournament was a robust 14-over 158. And for the past 13 years, Edgewood has thrown a mid-summer bash called the Celebrity Golf Championship, in which any athlete or entertainer with a familiar name and a 10 handicap or lower can compete for the $500,000 purse. Favorites appearing in this 54-hole stroke-play event have included John Elway, George Brett, Michael Jordan, Mario Lemieux, Dan Quayle and many others. 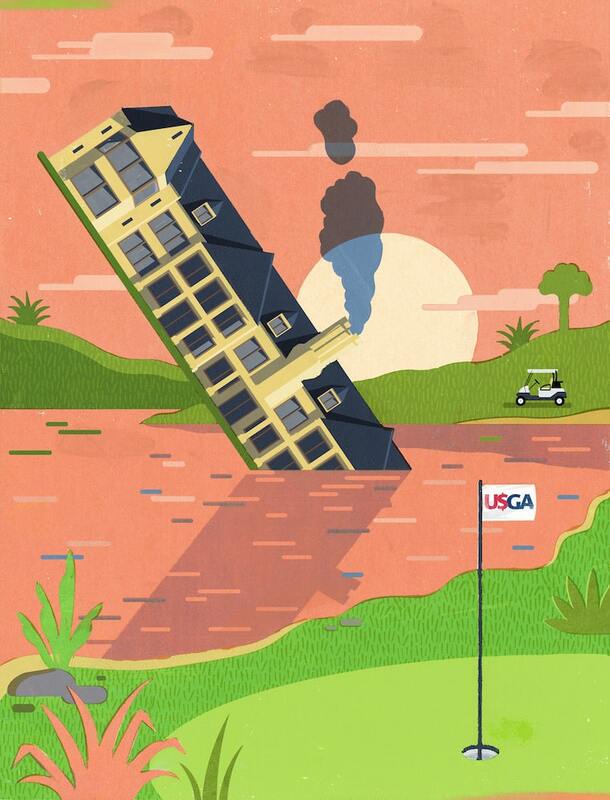 So how nice is this public course that’s on everyone’s top 100 list and exudes the VIP service and exquisite conditioning you’d expect at the toniest private club? For starters, its postcard beauty is so nearly perfect in every respect that it looks almost touched-up. It’s got pine-scented forests, clear streams and views of the bluer-than-blue, third-deepest lake in America, with the snowy pines of the Sierras beyond. 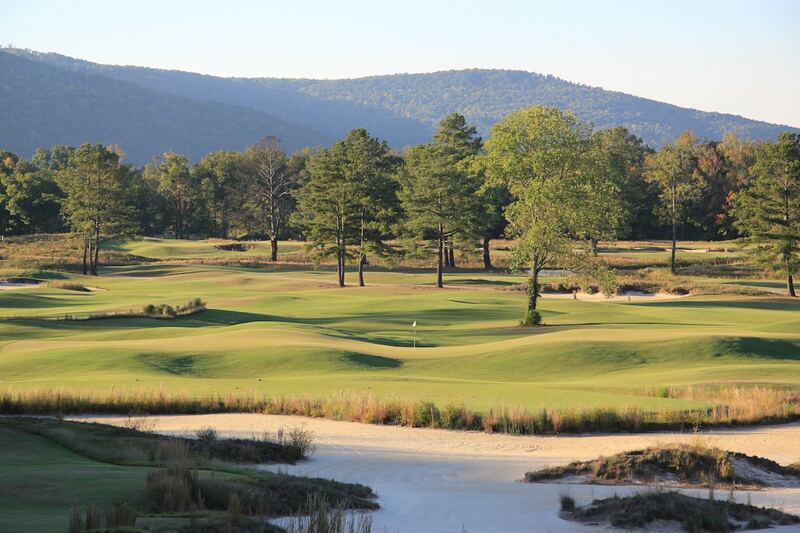 And at more than 6,200 feet of elevation, you might hit an 8-iron 190 yards, and what could be more beautiful than that? The longest of four sets of tees plays to 7,445 yards. Fourteen holes have water, and as the course routes through meadows and forests and over and around lakes, trees occasionally stand sentry, both in the fairways and in front of greens. But nothing at Edgewood seems tricked up or artificial, merely reverent. The first two holes—par-4s with lakewater borders and clusters of trees—provide a clean, classic introduction. No. 1 sports three bunkers; No. 2 has none. The third is Edgewood’s first great hole, a 599-yard epic dogleg right with troublemaking fairway bunkers loitering at the landing areas like greasers outside a corner store. The lay-up area is compromised by water on the opposite side of the sand. From there, the hole snuggles into a chute and climbs to an elevated green hosting a congregation of trees and two front-framing bunkers. Consider ordering the hefty breakfast burrito at the turn to reinvigorate yourself for the back nine. The challenging middle holes will prove crucial to scoring before Edgewood eases up a little. The finish here is more dramatic than difficult. When you rip your drive past the fairway tree on the 564-yard 16th, you’ll encounter your first direct view of the lake, which has lurked on the edge of consciousness for the past three hours—you knew it was there all along and felt the pull of its clear, blue waters. And finally, the course delivers it to you at just the right moment. The yardage book’s advice on No. 16: Lay up 125 yards in front of a green horseshoed by bunkers and backdropped by the lake. No. 17 presents a perky par-3 that runs parallel to the water—and perpendicular to the raging winds off of it. Edgewood Tahoe finishes with what could be the easiest birdie hole on the course—unless you’re basketball bully Bill Laimbeer, who launched three balls into a water hazard (since dubbed “Lake Laimbeer”) from 75 yards while leading the Celebrity Tournament one year. Daring players might reach the green of this par-5 in two by massaging a fairway wood or long iron over that same neck of water that juts in from the left. 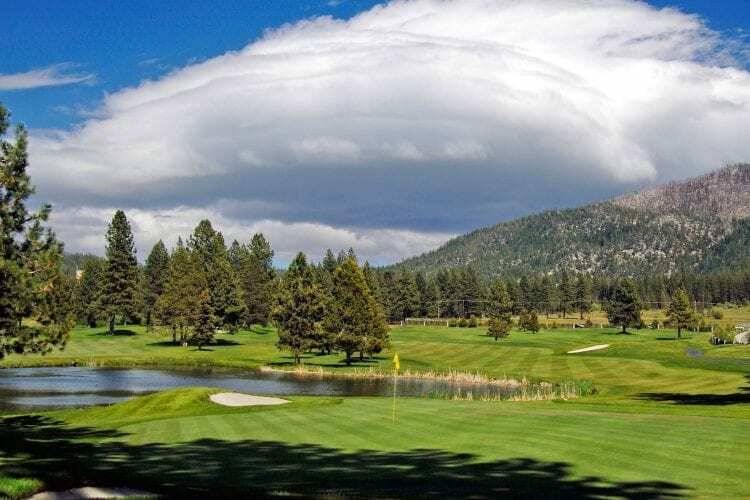 Edgewood Tahoe is one of those rare courses where you’ll remember virtually every hole. And if you came to Nevada to gamble—Stateline is a casino town—you can take some pretty good chances here. Even if you lose, the aesthetic payoff is eminently worthwhile.